Oradiyum pAruduththa nIr aLavum sella nimirndhadhu – if a person asked another, “tell me an equivalent of emperumAn’s divine foot”, the other person will say “emperumAn’s other foot”. His other divine foot rose all the way to the waters surrounding the universe as a cover (here pAr is taken to mean universe). This is similar to thirumangai AzhwAr’s periya thirumozhi 10-6-3 “pavva nIr udai AdaiyAgach chuRRi” (water circling the earth like its dress). If pAr were taken to be earth, the other divine foot rose till the waters surrounding earth. sUr uruvil – as per the thamizh lexicon “sUrum aNangum dheyvappeNNE” – sUr refers to a divine person. Here, this term actually refers to the demon pUthanA, but since she took the form of yaSOdhA, she is referred to as divine person. 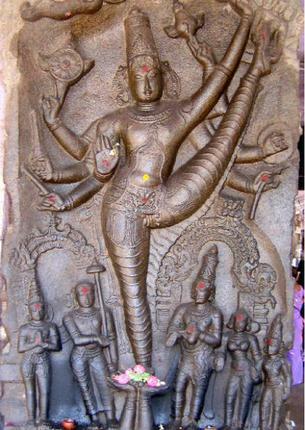 In perumAL thirumoizhi 7-5, kulaSEkara AzhwAr refers to yaSOdhA as “dheyva nangai yasOdhai” (the divine lady yaSOdhA). One can also consider sUr as a demon with a beautiful form. This is because demons are considered as belonging to the class of dhEvas as per the saying “piSAsO dhEva yOnaya:” in amara kOsam 1-1-11.
pEyaLavu kaNda – considering [measuring / estimating] her as a demon. Measuring is also killing. She [pUthanA] came to kill emperumAn, who, knowing her intention, killed her instead. Oh emerpumAn! When you measure someone, you don’t have any sorrow [difficulty]; but when someone comes to measure you, (s)he get killed, like pUthanA. perumAn – by killing her, you removed your enemy and gave yourself to the world as its Lord. AzhwAr points, out through this word, to harivamSam 65 which says “sthanyam thath vishasammiSram rasyamAsIth jagadhgurO” (the poisoned milk of pUthanA’s bosom was like a sweet juice to kaNNan, the Lord of the world). aRigilEn nI aLavu kaNda neRi – I do not know what you are thinking of. I do not know whether you are enabling me or not, to know you. Another interpretation – AzhwAr cannot estimate each and every deed of emperumAn’s. Just as you took the earth, which was snatched by mahAbali, under your feet, you had taken me under your feet and removed by enemies just as you removed pUthanA. We can take it that AzhwAr does not know this. We shall next take up the 4th pAsuram. This entry was posted in Other on June 9, 2017 by T N Krishnan.